architectural ruminations: Opening Tonight at Old North St. Louis! Opening Tonight at Old North St. Louis! Please read and share this notice regarding the upcoming exhibition opening for (en)visioning Hyde Park. The opening will take place tonight,Thursday, September 1st from 6pm to 8pm. 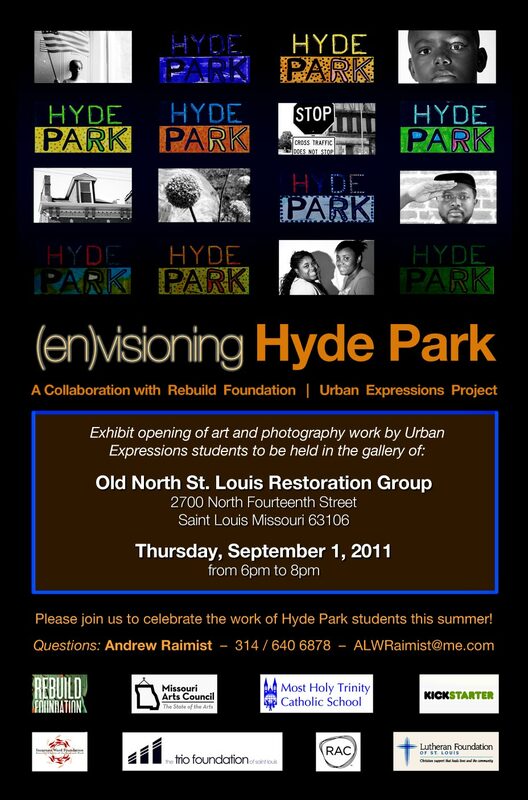 This very special opening features the work of Hyde Park middle school children who participated in Rebuild Foundation's Urban Expressions program in June and July. Andrew Raimist acted as digital photography instructor and the results of their summer's work will be on display. The kids receive awards and certificates as well as a book documenting their work over this summer which they accomplished alongside Washington University students in Theaster Gates' CityStudioSTL design-build program. The opening will include food and beverages, a slide show as well as a special collection of cameras spanning over 100 years from the Brownie to the digital point-and-shoot camera's used by the kids. The best event for 1s September ever!